The retail industry is perpetually in flux, with new technologies like AI, beacons and even phone charging stations propelling retailers into a new digital-enhanced landscape. 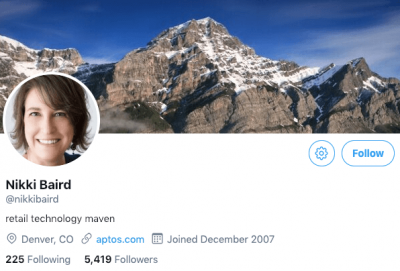 To stay in the know of all the latest retail tech news and exchange critical insights on the future of this ever-evolving industry, there’s no better platform than Twitter. 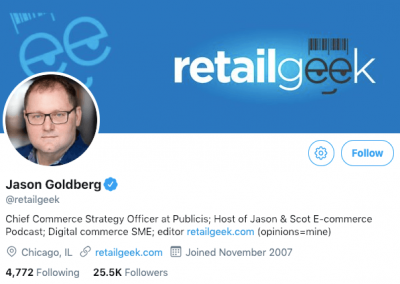 That’s why we’ve compiled this list of the top retail technology influencers to follow on Twitter in 2019. Check them out below and let us know on Twitter @ChargeItSpot if we missed anyone! 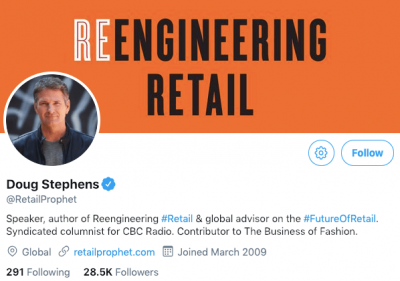 A self-described retail industry futurist, Doug Stephens – the founder of Retail Prophet – is a 20-year retail veteran, renowned speaker, global retail advisor, and author. 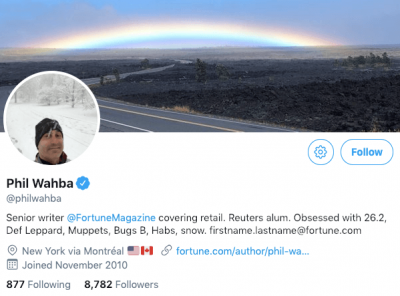 Phil Wahba is an award-winning senior writer at Fortune Magazine covering major retail and consumer products companies, from Target to CVS. 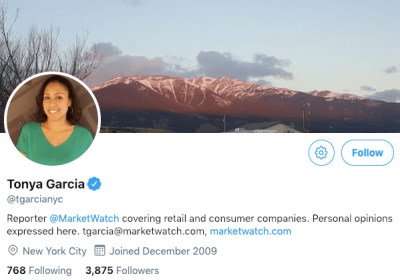 Tonya Garcia is a reporter at MarketWatch (a Dow Jones brand) covering retail and consumer companies. 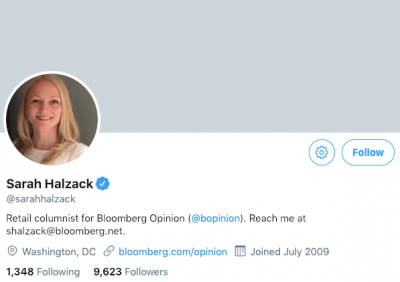 A columnist for Bloomberg Opinion, Sarah Halzack writes about the retail and consumer goods industry. 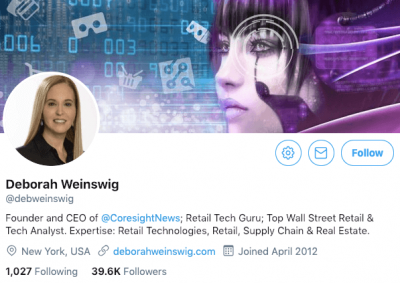 Deborah Weinswig is the Founder and CEO of Coresight Research, a research and advisory firm that helps companies navigate the intersection of retail and tech. She’s a renowned retail analyst with expertise in retail technology, supply chain and real estate. 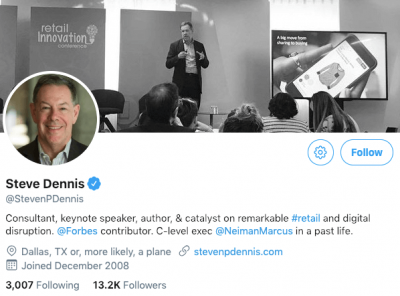 A former C-level exec at Neiman Marcus, Steve Dennis is a strategic consultant, keynote speaker, and writer on retail innovation and the future of shopping. 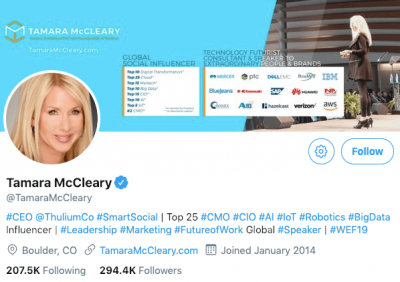 Tamara McCleary is the CEO of social media analytics agency Thulium. She was named the #1 most influential woman in MarTech by B2B Marketing and has been recognized by Entrepreneur Magazine as one of 10 Online Marketers to watch in 2018. 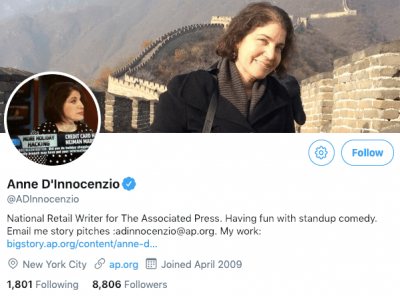 Anne D’Innocenzio is the national retail writer for The Associated Press. She regularly covers major retailers, particularly how big box retailers are overhauling their businesses in a dramatically shifting landscape. Nikki Baird is the VP of Retail Innovation at Aptos, a retail enterprise solution provider. With over fifteen years as a retail analyst for companies like Forrester Research, Nikki shares a unique perspective from all sides of the retail technology equation. Sanford Stein is the founder and moderator of RETAIL SPEAK, a LinkedIn forum for retail industry discussion and professional networking. 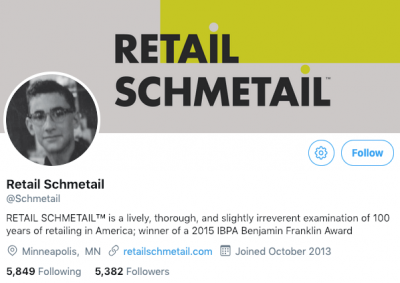 He’s also the author of Retail Schmetail, an examination of retail in America over the last century.